On 03 December 2018, Uttar Pradesh Basic Education Board (UPTET) has released a press release regarding UP Assistant Teacher Notification 2018. 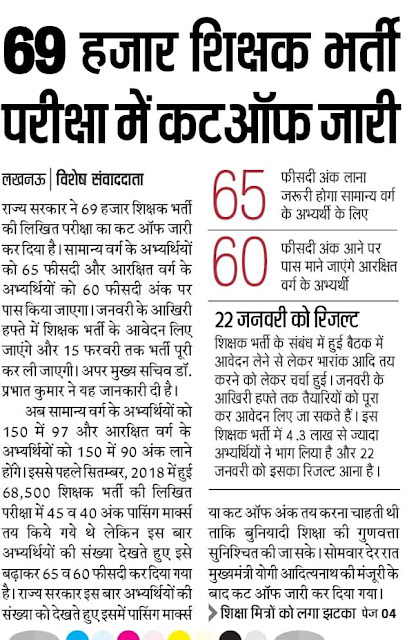 As per the details board has released the 69000 vacancies for the posts of Assistant Teacher (Sahayak Adhyapak). The applications in prescribed format have been called for the eligible aspirants. Those who want to apply are suggested to check complete eligibility norms from this page. The procedure for the UP Assistant Teacher Online Form will starts from 06 December 2018 and will be ends on 20 December 2018. Individuals are recommended to submit the application form within a scheduled period of time. The selection of the candidates will be done through written examination which is going to be held on 06 January 2019. Scroll down and get other details of UP 69000 Assistant Teacher Notification 2018. After reaching to the home page select an appropriate link for UP Assistant Teacher Notification 2018. A PDF file of the notification will appear at your screen read the notification details carefully. Now fill the application form as per the guidelines available in official notification. Upload the scanned copy of your signature and passport size photograph. Recheck the filled application form and submit the application form. Finally, take a print out of the same for the future reference.